Mother of six: Mattie (Herman W. Niedert), Johann H., Rebecca (Albert W. Huenerberg), Herman J., Henry J. (Erna Behrens) and Adelheid Franziska Von Engeln. 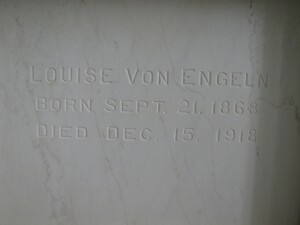 Louisa Elizabeth Thuernau was born September 21, 1868, in Will County, Illinois. She was baptised and confirmed in St. John’s Evangelical Church. On July 10, 1887 she was united in marriage to Herman Von Engeln. 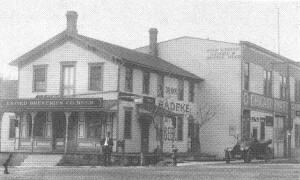 They resided on a farm east of Beecher for a number of years, when they purchased “The Old Tavern” on Chicago Road and moved to Beecher. 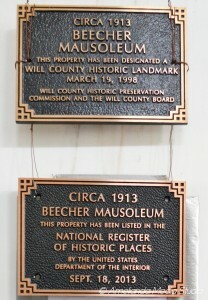 Selling their business in 1916, they moved to the west suburb of Beecher. 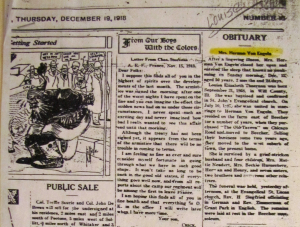 Louise is survived by her grief-stricken husband and four children, Mrs. Mattie Niedert, Mrs. Beckie Huenerberg, Herman and Henry, and seven sisters, two brothers and numerous other relatives. Charlotte was the mother-in-law of Louise Von Engeln’s daughter, Mattie Von Engeln Niedert who was married to Herman W. Niedert.